Re-create the penny floors from this South Loop bar. Owner Ron Vaisman is speaking literally when he mentions “pinching pennies” in reference to his bar’s signature design element. 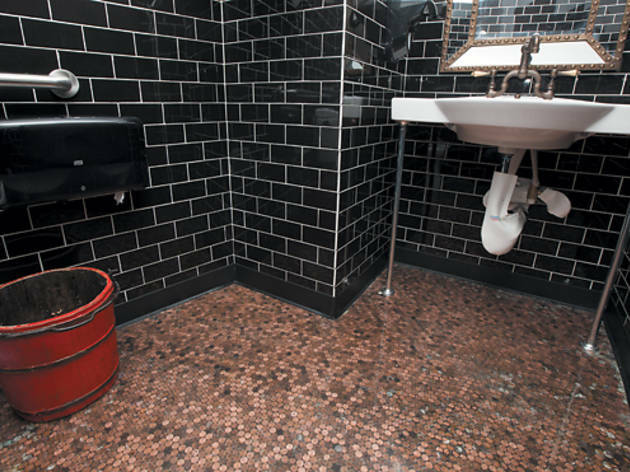 The bathroom floors at Square One (1400 S Michigan Ave, 312-786-1750) are composed entirely of pennies—25,500 of them, to be exact. “I wanted a contrast [with the black subway tile] and something with an antique-ish feel,” Vaisman says. “I couldn’t find what we were looking for with copper tiles, and I said how I wanted it to look like old pennies…that’s how we came up with it.” How to do it: First determine the amount of sheen you’d prefer in your coins. Soak them in a cup of Coca-Cola to remove the oxydization, or, if you prefer the variegated look of Square One’s floor, leave the rolls of pennies from the bank as they are, with a natural variety in shininess. Level your concrete or use a flat surface such as plywood as your foundation. Then set each penny down one by one, securing with super glue. 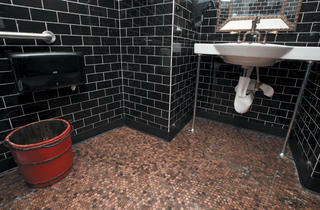 Carefully apply black grout in all of the open spaces; the black provides a nice contrast to the copper-colored pennies. Top off the pennies with a little less than a quarter-inch of acrylic to preserve the surface, leveling off to prevent air bubbles. At Square One, it took four people about a week to complete the floor. “Two-hundred fifty-five dollars for a copper floor people talk about all the time isn’t that big a deal, but you do lose a week of your life,” Vaisman says. His work seems to have already paid off: Not only has the floor garnered the attention of many customers, it’s also inspired this issue’s cover.